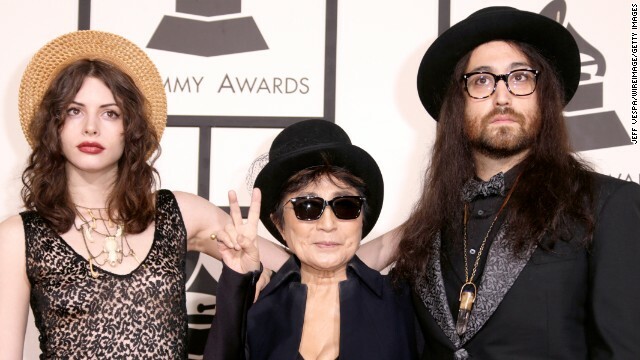 Sean Lennon, right, with partner Charlotte Kemp Muhl and mother Yoko Ono at the Grammy Awards. In late 1974, John Lennon made his last on-stage appearance at New York's Madison Square Garden to pay off a bet he'd made with Elton John about "Whatever Gets You Through the Night" hitting No. 1. Elton was right - it did - so Lennon showed up to play three songs with the Elton John Band: "Whatever Gets You Through the Night," "I Saw Her Standing There" and "Lucy in the Sky with Diamonds," a Beatles song that Elton had just covered (and would also hit No. 1). Almost 40 years later, another Lennon was on another New York stage to sing "Lucy" - John's son Sean, who joined the Flaming Lips in a performance on "The Late Show with David Letterman." In typical Lips fashion, it was a wild performance. "Lucy" is part of a mini-celebration Letterman's been having to mark "Beatles Week" - the 50th anniversary of the Beatles' appearance on "The Ed Sullivan Show." Letterman does his talk show from the same studio Sullivan used. In fact, the theater - known as CBS Studio 50 in Sullivan's day - is now called the Ed Sullivan Theater. Other performers have included Lenny Kravitz doing "Get Back" and Sting doing "Drive My Car." Paul McCartney and Ringo Starr have also dropped by.